In 1910, Dante Trussardi, master glove-maker, set up his company in Bergamo, Italy, creating finely made gloves which were soon sold all over the world. In 1970, Nicola, Dante Trussardi's nephew, took over the company after the sudden death of his father and brother. Taking full advantage of the company's experience with leather work, he decided to diversity the company's products. He bought a tannery and with the help of experts studied new procedures for treating and refining leather to make sophisticated products. In 1973 Trussardi launched his label for bags, suitcases and small leather goods. He used as his logo, the greyhound dog, fast and delicate, which has always been tied to the history of painting. The immediate success of the first leather collection encouraged him to add more products to the line, such as belts, shoes, umbrellas and ties. In 1976, the first Trussardi shop was opened in Milan selling leather jackets and other leather goods. Today the network of shops in Italy and abroad includes 183 boutiques. 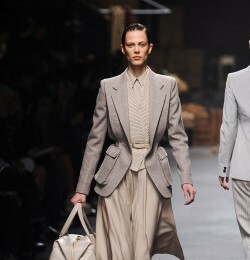 In 1983, Trussardi presented the first womens ready-to-wear collection during the twice yearly Milano Ciolezioni shows. He chose as a setting, the romantic ambience of La Scala Opera House in Milan. 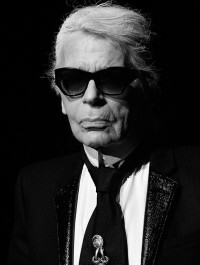 He followed this a year later with his first Menswear collection shown at the Modern Art Pavilion in Milan. 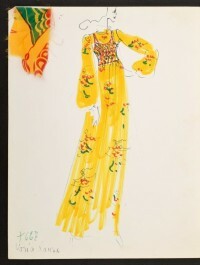 1983 was the year of the debut of the pret-a-porter collections, with a show at Teatro alla Scala in Milan. In the meantime Trussardi also applied his sense of beauty and functional quality in the field of design, creating objects for personal use, as well as an elegant bicycle, and rethinking the styling of motorcycles, car interiors and even aircraft interiors. Throughout the 1980's, the menswear and womenswear collections were very successful, and the company was doing very well. However, sadly, on April 3rd, 1999, Nicola Trussardi died. He crashed his car on the way home, went into a coma and did not recover. He was only 56 years of age. His daughter Beatrice and son Francesco carried on the house. French designer Nicolas Ghesquiere took over the design helm for 2 collections in 1997, followed by Jeremy Scott, a Paris-based American, who joined in 1997 and designs Trussardi Jeans, Trussardi T-Store and Trussardi Sportswear. The Nicola Trussaudi Foundation has been set up to host exhibitions and cultural events in keeping with Nicola's love of art and culture. In 1999 Beatrice and Francesco Trussardi approached the task of moving forward with the entrepreneurial program of their father, while immediately bringing their own personal, innovative touch to the identity of the maison. The group's management takes on a dynamic, innovative approach, in tune with the times. In January 2003, after only 4 years running the company, 29 year old Francesco Trussardi, who had taken over the Trussardi house on the death of his father, was himself killed in a road accident in Northern Italy. This was a terrible tragedy. In spite of the death of Francesco Trussardi, the house of Trussardi presented their Fall 2003 collection during Milan Fashion Week in March 2003. It was very well received. It included splashes of orange and turquoise pony skin, zigzag patterns in leather skirts. The only sad note came when the crowd gave an ovation in support of Francesco's sister Beatrice Trussardi, when she came out alone on the runway. Beatrice Trussardi (born 1971) is continuing the house. She presented the Fall collection in Milan during Fashion Week in February 2004.